February is the month of love and what better way to say a long and lasting “I love you” than with the gift of a plant for the patio. The hibiscus makes a lovely addition to any patio and is a subdivision of flowering plants that is made up of around 220 different species that are quite diverse, including hot-climate evergreen shrubs and small trees, as well as seasonal temperature-zone shrubs, and some annuals and perennials. The most recognisable of these is the Hibiscus rosa-sinensis, otherwise known as the Chinese Rose, Red Hibiscus or Shoeflower. The Hibiscus rosa-sinensis, or Shoeflower, is characterised by its blood-red flowers, and while red might be the romantic colour of love, the name Shoeflower comes from the rather unromantic Jamaican use of crushing the flowers to polish black shoes. This species of hibiscus originated from an ancient hybrid from the Indian Ocean region and can be identified as a glossy evergreen shrub that can sometimes be as much as 4,5m high and wide. Its red flowers are the characteristic funnel shape with 5 overlapping petals and a central column of fused stamens. Each flower only lasts a day, opening in the morning and withering by evening, but they appear in long succession, as long as the weather is warm. They prefer a frost-free environment. 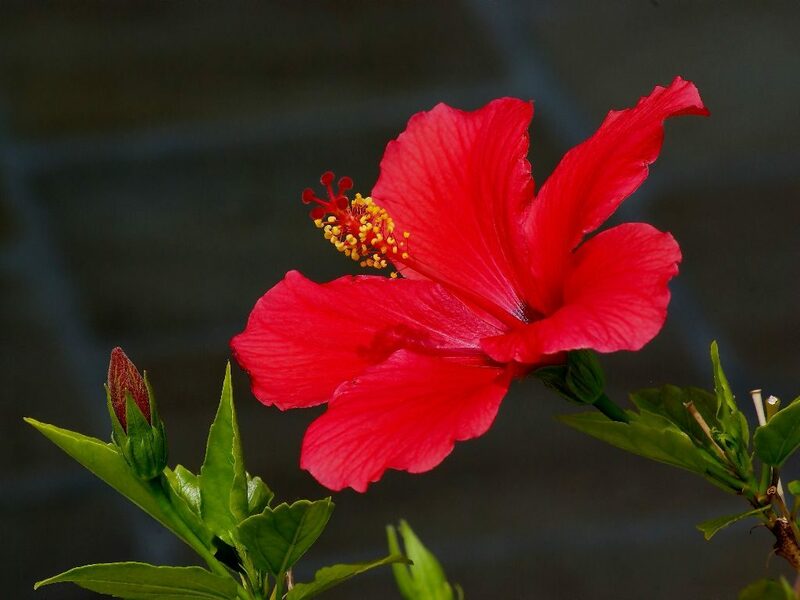 Hibiscus plants are easy to grow and they thrive in sunlight and well-drained soil. They are versatile and can be grown outdoors or indoors. They make beautiful flowering plant bushes and perform best when their roots are slightly crowded, so pay attention to the size of the pot you get for your hibiscus. Read below for details on caring for your patio hibiscus. Hibiscus thrives in full to partial sunlight, although in hot climates like ours, you might want to opt for partial sunlight rather, which makes these plants perfect for your patio. Hibiscus are thirsty plants and will only thrive and blossom if given enough water. In warmer climates, they may need to be watered daily, or even twice a day in extremely dry conditions. They don’t like to dry out, however, avoid drowning your plant as they do not like to be soaking wet. Keep the soil moist by watering you hibiscus slowly. You can tell if your plant is not getting enough water if it starts to drop its leaves or turn yellow. Hibiscus respond well to balanced fertilisers, either slow release or water-soluble, and do best when given fertiliser frequently but lightly. If you are using a water-soluble fertiliser, use a weak solution every two weeks in spring and summer and four weeks in autumn and winter. You’ll only want to fertilise four times a year if you are using a slow release feeder; early spring, after the first round of blooming, mid summer and early winter. Watch out for pests such as spider mites, aphids, thrips, scale, and whiteflies. Pests can usually easily be controlled by applying an insecticidal soap spray. Be sure to only apply the spray when the leaves are out of direct sunlight to avoid burning them. Cool morning or early evening are the best times to spray. With their discernable trumpet-shaped flowers blooming every day, a hibiscus will make an eye-catching addition to any patio.